Offset printing on plastics has numerous advantages, especially for applications that require durability with high impact. 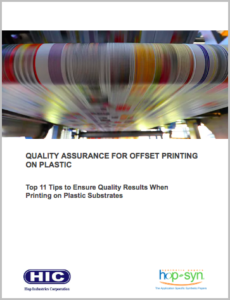 To ensure quality throughout the printing process, we created the latest tips guide to help press operators avoid common printing challenges. For example, press operators may encounter challenges with ink drying or color sequence, which can impact the quality of output. Poor ink/water balance, or ink drying too slow can also have ramifications. The Hop-Syn offset printing guide is a helpful resource that addresses these challenges and more. Hop-Syn is one easiest synthetic papers to print on via offset, which is why many print service providers prefer it. It’s also one of the top substrates specified by big brands because of the high-quality output and environmentally-friendly properties. Hop-Syn comes in multiple grades to suit every printing application such as P-O-P displays, banners, blockout and backlit signs, as well as hang tags, book covers, maps and more. Hop-Syn experts are always available for advice about everything related to the durable substrate, such as grade selection, printing processes, finishing and fabricating, including die cutting, folding, drilling, and gluing.